There is a high degree of illiteracy amongst the local population. A high proportion of the local population never went to school. They have little or no knowledge of language apart from mothertongue, and in most cases don’t know how to write etc. 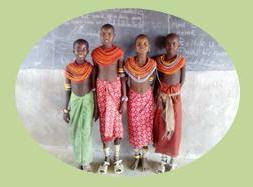 Bead children seem eager to learn and spent a lot of time idling. Those children who are wearing beads as mentioned previously do not go to school. Apart from those who are send to look after goats, they usually just tend to idle around the manyattas. They have been observed passing the school sometimes in the afternoons, curiously looking at books, and it is obvious they are very eager to learn. Children are dropped out of school by their parents despite being clever. Quite a few children are being dropped out of school a few years after they started. This does not happen because the child is not following the lessons, in fact those children are often very clever. Young girls are exposed to FGM and child marriage. Every individual of Rendille tribe has to undergo FGM before being able to get married. If they refuse they are outcasted from their families and the whole clan. Nobody is going to marry them and they are treated like they are no longer a human being. Also, quite a few girls are affected by early child marriage (as young as 8y). They might even be booked already as newborns by old men. They are denied the opportunity to lead a life of free choice, self-development and their life is already pre-determined as young children. They are also not allowed to go to school. Many women are found idling around the manyattas. As farming is not possible in the area due to the dry climate, many people especially women have no activity to engage themselves in. The way of thinking/ view of life of non-educated people is very different from those who went to school. When engaging in a conversation with for example a moran is easily noticeable that the way they view and understand things differs immensely from when you talk with an educated person. They tend to be narrow-minded, having little or no imagination of the outside world and may react differently in situations of disagreement. It might even lead to physical violence.